(per an article from goodreader.com). Your first reaction might be, ‘OH NO! NOT THE SPINES! OUR BELOVED BOOKS!” But hey, if the spines of books prevent information from being shared, then so be it. Cut off the spines. What is the function of book spine? To keep pages together. To keep pages in a unit. To keep the pages organized. But then the spine also performs the function of keeping the pages out of the hands of millions of other people. A book spine keeps a book closed. When you open the book, the pages curl in the center–wanting to return back to their closed state. The book spine wants the pages to be closed. 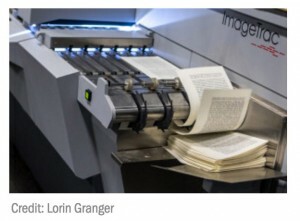 How symbolic it is that Harvard is cutting off the book spines in order to digitize the pages and let the pages be free. With digitization, these pages can not only be seen by more people, these pages can be reorganized, compared, contrasted. May we remove the spines constricting our knowledge. One medium’s use of a format to unite and encourage knowledge does the exact opposite for other media. To clarify, the spine working on a book unites and encourages knowledge. For digital applications the spine on a book hinders and prevents knowledge.